Wittman's Wild Ride on the sidewalk with the bride and groom from next door. This quote might be a little too modern for the tastes of some FoW players, unfortunately it speaks to our experiences this past weekend very well. If you’ve not heard yet, the joint effort between Outpost Gaming and the Battle Badgers to set a world record this past weekend was unsuccessful. We briefly described the technicality that shot our attempt dead in a previous post, so I’ll not bore you with details. I’ll simply say that it wasn’t for a shortage of effort, enthusiasm, or caffeine that we failed to break the record. We were presented with a choice, and chose to concentrate on the scenario boards, and being good hosts, rather than the record attempt. Instead, this post is meant to discuss what went right with the event, essentially, everything other than the marathon gaming attempt itself. First, let’s take a look at a couple of the boards that Ken at Outpost Games, put together for this event. These tables have a lot going for them. Not only are they gorgeous, they’re easy to play on (though rolling dice on the top of Pointe Du Hoc is not recommended), and they all live at Outpost Games in Kenosha Wisconsin. If you want to play on these beauties call Ken at Outpost Gaming (262-653-1170) and set up a date for your club. Further, out of his love for the game, and the kindness of his heart, Ken has agreed to let us Battle Badgers bring one of these tables out on our Ranger days, if you ask us for it. So if you’d like to play through the Easy Green scenario on this board, with our models, in your store, set up a Ranger Demo Day with the Battle Badgers (We’re taking one down to Unique Gifts and Games in Grayslake this coming weekend 6/14). Second, let’s talk about the turnout. We had over 30 people sign up for the event. However, most everyone had signed up for Friday Night, Saturday, or Sunday. We’d sort of expected to have the place to ourselves Thursday Night, and most of Friday. Boy we’re we wrong. Outpost Gaming had 16 people in it to kick off the event Thursday at midnight, including one fella who drove 4 hours from Indianapolis to play. Throughout the entire weekend we saw 27 different players, and something better than 200 visitors who popped in just to see what we were doing. Scott's borrowed Brits prepare to overwhelm the German defenders in a bit of Sieze and hold. Steve and Erik struggle against the current to Hit the Beach on Easy Green! 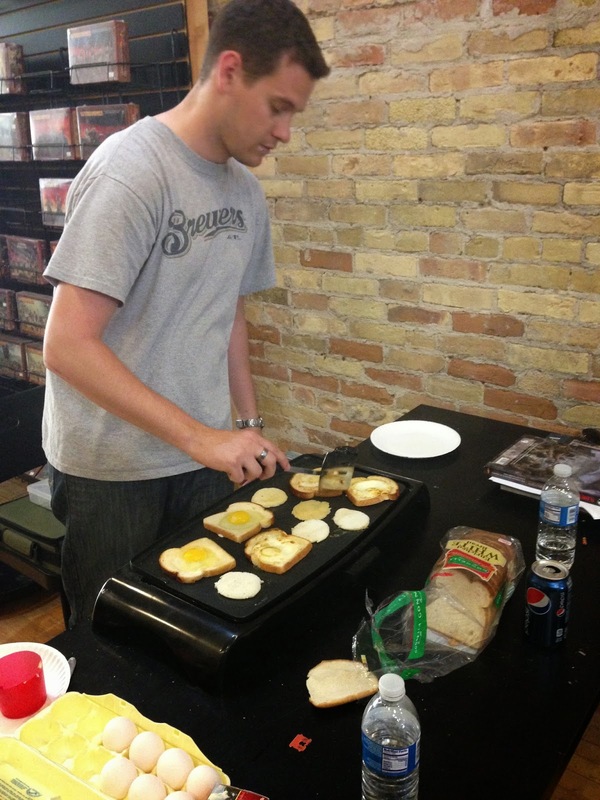 Rick fries up some breakfast for everyone who played through the night, or arrived early on Friday morning. We were able to make a couple of new Flames of War players this weekend, and raise a couple of bucks for a good cause. Battlefront provided some prize support that we raffled off, along with a few donations from Outpost Gaming, the Battle Badgers, and even a brand new Konigstiger donated by one of our guests, Chris Novak from Indianapolis. Battlefront also sent us a couple of old briefings to give away as door prizes to the folks who stopped in just to see what we were up to. It would’ve been awesome to set a world record this past weekend, however I’m very happy with the outcome of this event. Besides, we learned a lot, and there is always next year.